The ex-wife of an oil tycoon won't get any more than the $1 billion she already pocketed in their divorce -- but not for a lack of trying. 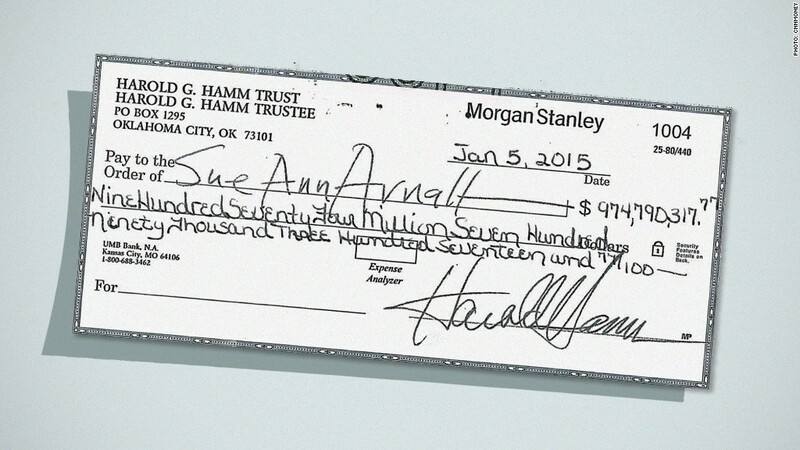 An Oklahoma court told Sue Ann Arnall Tuesday that she won't be getting any more money from her ex-husband Harold Hamm. The main reason? She already cashed a check he gave her for nearly $975 million. Despite taking the check to the bank back in January, Arnall had filed an appeal, claiming that she was entitled to more. She's an economist and a lawyer, and held executive positions in Hamm's oil company Continental Resources (CLR) during their 26-year-marriage. By Arnall cashing the check and taking over certain bank accounts and a 401K fund that was awarded to her, the court said she already "voluntarily accepted" the settlement, according to the Oklahoma Supreme Court's opinion handed down Tuesday. It dismissed her appeal. Meanwhile, Hamm is appealing to the court that he should owe his wife less. He's a rich man, but not as rich as he was a year before. Thanks to the dramatic drop in oil prices, his company's value has taken a hit, along with his personal wealth. Arnall's attorney declined to comment until he had time to read the opinion. Craig Box, a lawyer for Hamm, said they were "very pleased" with the court's decision.